When I took that battery of tests to start my journey in Naval aviation there was a section that to this day I can’t get out of my mind. 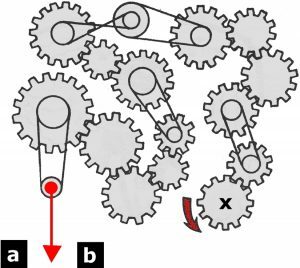 It was a series of pictures of gears that were all connected, and in each case one gear turned either clockwise or counter-clockwise and you needed to quickly determine what direction the last gear would then turn. I loved it and I hated it! Trying to get the correct answer had my pencil going in circles first left and then right and then left and then right… you get the picture. That’s what I loved, but the time element involved is what I hated. I had to know the answer but time forced me to move quickly and it seemed that it always wound up in a guess. As I read a favorite scripture this morning the picture of those gears came into my head. 2 Peter 1:5-8 But also for this very reason, giving all diligence, add to your faith virtue, to virtue knowledge, 6 to knowledge self-control, to self-control perseverance, to perseverance godliness, 7 to godliness brotherly kindness, and to brotherly kindness love. God has given us all that we need to deal with the “turns” in life but we need to get in the habit of “adding” one turn after another giving all diligence; spouden – haste, zeal, earnest care. As Oswald Chambers says: To take the initiative and make a beginning, to instruct yourself in the way you have to go. And it’s God that places all the twists and turns into our life that are designed to get us to take the initiative and stop waiting for “more” guidance, more direction. We need to get into the habit of moving ahead and stop asking for more information when He has shown us the way. We need to get into the habit of immediately stepping out in faith. I have often found myself responding to the Lord’s direction by trying to figure out that if I take that step, where will it wind up; what’s the endgame, which way does the last gear turn. And like those tests, there are so many options that it can drive you nuts trying to figure things out. God never clearly shows me the answer, He just expects me to “make” the first gear turn and move onto the next. It’s all about taking that next step of faith without looking back or forward, it’s all about living one day at a time (Matt 6:33-34). Rom 8:28 And we know that all things [every gear] work together for good to those who love God, to those who are the called according to His purpose. So, here’s the key. The next time God speaks, be obedient and immediately take the first step (turn the first gear) and know that He will then reveal the next and the next; one gear at a time. And like the test, there is a time element involved so make it a habit to step out and stop trying to figure it out. We are only here for a short period of time and the Lord has a great deal He wants to get accomplished in our life in order to conform us into the image of Jesus (Rom 8:29)… you knew I’d get it in… before the last gear turns and we step into eternity. So, as Moffatt says… Furnish your faith with resolution. I have been loving your blogs ever since I happened upon them (just as Ruth happened to be in Boaz’s Field) moved by the invisible hand of the Lord. Today I receive this encouragement to not delay in following and trusting the Lord, this whether or not I know what the next step will be. May the Lord continue to bless you. Grace and peace to you always in Jesus name. Thank you Suzy… I find myself mostly repeating what the Lord is saying to me on a personal level. My prayer is that it helps others… you made my day!